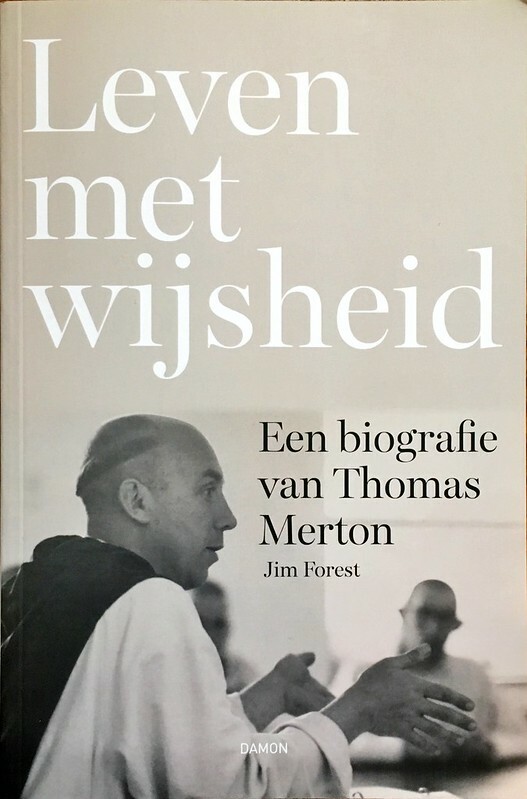 There have been a number of editions in various languages of my biographies of Thomas Merton but none has pleased me so much as the translation of Living with Wisdom into Leven met wijsheid. The reason is that, although I speak Dutch poorly, the Dutch-speaking region of Europe has become my much-appreciated home. I have been here forty-one years, well over half my life. Living a few centimeters above sea level in North Holland, so close to the North Sea that I can get to its shore by bicycle in less than an hour, was not a destiny I ever imagined for myself as a child studying globes and world maps and gazing at photos in National Geographic magazine. This land of polders, canals and sand dunes was not one of the environments that attracted me as a boy. My fantasies were of someday living in France, Italy, Spain, Greece or Great Britain, not the flat water-soaked delta that divine providence brought me to in 1977. I came here to lead the staff of a Dutch-based peace organization, the International Fellowship of Reconciliation. For twelve years working for IFOR was my more-than-fulltime employment. By 1988, when I shifted to work as a writer and editor, our family had taken root in the Lowlands. 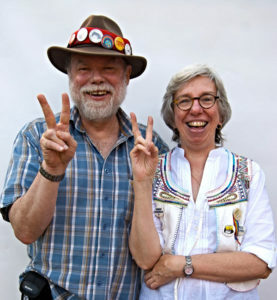 In 1995, Nancy and I became Dutch citizens. In both our cases, it was a return to parts of our family roots. Nancy’s paternal grandparents had been born in Gelderland while one of my ancestors, Hendrik Hendrickson, was born in Utrecht in the late sixteenth century. Hendrickson was my mother’s maiden name and is my middle name. According to family legend, Hendrik Hendrickson was navigator of the Dutch ship, the Halve Maen, that sailed up the Hudson River in 1609. Later on he settled in Nieuw Amsterdam. His house stood next to the settlement’s wall at the southeast corner of what today is the intersection of Broadway and Wall Street. Probably it’s a great blessing we don’t still own that parcel of land. The New Testament doesn’t recommend wealth. Thomas Merton moved with me to the Netherlands. He had become one of the major influences in my life since first reading The Seven Storey Mountain when I was eighteen. Though by necessity I had to leave quite a few books in America when I flew to Amsterdam, not one fragment of my Merton library was abandoned. The work I was doing occasionally brought me to London, where I made it a habit to spend a little time during each visit at a remarkably beautiful and hospitable church, Westminster Cathedral. I loved its Byzantine mosaic decoration and its huge Stations of the Cross that had been carved by Eric Gill during the First World War. I loved its sung Masses. I loved its kindness to homeless street people. I also loved it as a place to confess my sins. There was no language barrier to navigate and there seemed to be a priest available in .one of the confessionals no matter the day or the hour. One of the things one found in the adjacent cathedral bookshop was a rack full of booklets published by the Catholic Truth Society. These were inexpensive, well-written tracts on a wide variety of subjects — theology, liturgy, prayer, the sacraments, religious history and other topics. A good many were short biographies of saints or notable Catholics. Noticing that there was no booklet devoted to Thomas Merton, in 1978 or ’79 I decided to contact the Society’s editor, Brendan Walsh, and volunteer to fill the gap. I felt reasonably well-suited to the task. I had been one of Merton’s frequent correspondents and occasional visitors the last seven years of his life, and I was a journalist as well. And it wasn’t, after all, a major undertaking. Most of the Society’s booklets were pocket-sized and brief — 24 to 32 pages — roughly two thousand words. So it was agreed. I was even offered a payment — fifty pounds on delivery, as I recall. As my salary was quite meagre, this made the project even more attractive. And so I set to work. The only problem was that before I had gotten past Merton’s teenage years, I had already written at least a thousand words. I found myself trying to fit a Frisian cow into a confessional. I wrote to Brendan and raised a question: How about publishing a small book instead of a booklet? And, thinking like the lover of photography that I am, including some photos? I proposed as the title Thomas Merton: A Pictorial Biography. Happily Brendan’s answer was a cheerful yes. Then came the idea of making the book a trans-Atlantic project with a co-published edition in America. Don Brophy at Paulist Press quickly took to the idea and even suggested the book be designed by Emil Antonucci, whose work with Jubilee magazine, Commonweal and many publications by Merton’s close friend, Bob Lax, I greatly admired. Meanwhile I had work to do. I recall with pleasure many nights, after the children had gone to bed, banging away on my beloved Hermes portable. “Banging” is indeed the word — even Swiss typewriters are noisy tools! I used the kitchen counter as my desk as it was the furthest point in the apartment from the kids’ room. They needed their sleep. Volumes of Merton were spread out left and right in that cramped space. Thomas Merton: A Pictorial Biograph, my very first book, was published in the Fall of 1980. Exactly a hundred pages long, it offered the reader a compact overview of Merton’s life and was enriched by many marginal quotations from his writings. In mid-December I had the honor of presenting a copy to Pope John Paul II and was surprised to discover how familiar he was with Merton’s writing, thanks to Polish translations issued by John Paul’s own publisher. On that occasion I was accompanying my friend and colleague Adolfo Perez Esquivel who a few days before had received the Nobel Peace Prize for his human rights leadership in Latin America. It had been Adolfo’s decision to give John Paul this gift. He told the pope of the important role Merton had played in his own spiritual formation. That first book marked a turning point in my life, launching me into a late vocation as a writer. Since 1980, there have been more than twenty books — books on the basic teachings of Jesus, religious imagery and iconography, pilgrimage, confession, and overcoming enmity. There have been two books on religious life in Soviet Russia in the USSR’s last few years, and a book on the resurrection of religious life in post-Communist Albania. I’ve also written two other biographies, one of Catholic Worker founder Dorothy Day and one about Daniel Berrigan. Not least, there have been five children’s books. In 1989, after the Paulist edition of the Merton biography had gone out of print, Robert Ellsberg of Orbis Books suggested I write a new, expanded edition. The content was so changed that the book got a new title, Living with Wisdom. And then, in 2008, a revised and substantially enlarged edition of Living with Wisdom was issued by Orbis that drew on Merton’s hitherto closed private journals and correspondence. It’s the Dutch translation of this third edition we’re celebrating today, a book that would not exist had it not been for the Dutch-Flemish Merton society, Mertonvrienden, and especially Willy Eurlings, who may now know the book better than I do. Married as I am to a translator and counting a number of translators among our friends, I know what a special skill good translation is. It’s a fortunate author whose work is converted into another language by the right person. Meanwhile I’ve had one more Merton book to write, The Root of War is Fear: Thomas Merton’s Advice to Peacemakers. Published two years ago, it focuses on the contribution Merton made during his last decade in helping prevent nuclear war, articulating a theology and praxis of peacemaking, and giving spiritual guidance to peace activists like myself. To sum up: The major goal of my several Merton biographies has been to present a reasonably complete portrait of a complex, multifaceted and yet integrated man. His engagements and interests, not to mention his talents, were so numerous: writer, poet, monk, hermit, artist, photographer, teacher, scholar, translator, correspondent, journal keeper, editor, friend, spiritual guide, environmentalist, explorer of other religious traditions, monastic beatnik, voice of socially engaged Christianity, and mystic… And this is not a complete list. The challenge has been to try to show how all these strands are woven into a harmonious whole and at the same time allow Merton to speak for himself. Though Merton is now half a century in his grave, his writings remain fresher and more timely than today’s newspaper. My sense is Merton is someone many Dutch readers will find worthwhile and challenging. Willy Eurlings asked me to add to these remarks some comments about how I cme to meet Merton and what were my first impressions. It was thanks to Dorothy Day, founder of the Catholic Worker movement, that I came into personal contact with Merton. Knowing I had read several Merton books, Dorothy began to share with me the occasional letters she received from him. One day in the summer of 1961 she gave me a letter of his to answer. He had sent her a poem about Auschwitz and the Holocaust, “Chant to Be Used Around a Site for Furnaces.” Dorothy asked me to write to Father Louis, as she called him, letting him know of our appreciation of the poem and our plans to publish it in the next issue of The Catholic Worker. A few weeks later, she received another submission, this time an expanded version of a chapter, “The Root of War is Fear,” from the book he was then writing, New Seeds of Contemplation. It was an impassioned anti-war essay that, once in print, got Merton into a great deal of trouble within his order. Once again, Dorothy asked me to respond, letting Merton know it would be in our October issue. Not many days later I had a response from Merton in which he noted that we live in a time of war and the need “to shut up and be humble and stay put and trust in God and hope for a peace that we can use for the good of our souls.” This proved to be the beginning of an intense correspondence between us that lasted the rest of Merton’s life. In December, Merton suggested that perhaps I would like to come to the monastery for a visit. Traveling by thumb, a co-worker, Bob Kaye, and I set off for Kentucky early in February 1962. The going was slow. I recall standing in nighttime sleet at the side of a highway somewhere in Pennsylvania watching cars and trucks rush past, many of them with colorful plastic statues of an open-armed Jesus of the Sacred Heart on the dashboard. Sadly, this image of divine hospitality seemed to have little influence on those at the wheel behind the statue. It took us two-and-a-half exhausting days to travel the thousand miles to the Abbey of Gethsemani. Finally we reached the monastery. After the Guest Master, Father Francis, showed us our rooms, my first stop was the monastery church, but my prayer was cut short by the sound of distant laughter so intense and pervasive that I couldn’t resist looking for its source. Laughter was the last thing I expected to hear at a penitential Trappist monastery. The origin, I discovered, was Bob Kaye’s room. As I opened the door the laughter was still going on. The main source was the red-faced monk lying on the floor, wearing black and white robes and a broad leather belt, his knees in the air, hands clutching his belly. Though more well-fed than the broomstick thin Trappist monk I had imagined, I realized instantly that the man on the floor laughing with such abandon must be Thomas Merton. His face reminded me of photos of Pablo Picasso. The inspiration for the laughter? It proved to be the intensely smell of unwashed feet that had been kept in shoes all the way from the Manhattan to Gethsemani and were now out in the open air. If the Catholic Worker had manufactured a perfume, this would have been it. After that week-long stay at Gethsemani, The Seven Storey Mountain became a different book. No wonder that Merton had twice mentioned the films of Charlie Chaplin in its pages. The abbot, Dom James, though a most hospitable man, was not initially quite so positive about a visitation of ragged Catholic Workers. In those days most American men had frequent haircuts, but, as far as Bob and I were concerned, haircuts were a massive waste of money. Merton apologetically explained that our shaggy hair did not please the abbot. If we were to stay on at the abbey, Dom James insisted we have haircuts. Merton hoped we wouldn’t object. No problem, we replied. On our second morning at the abbey, we took it in turns to sit in a chair in the basement room where the novices changed into their work clothes. The room also served as a barber shop. While the novices stood in a circle laughing, a good deal of hair fell to the concrete floor. Going from one extreme to the other, Bob and I were suddenly nearly as bald as apples. Not every monk appreciated Merton, I discovered. Merton and I were walking down a corridor that linked the guest house kitchen to the basement of the main building. There was a point in the corridor where it made a turn, and standing there, next to a garbage container, was an older monk, Father Raymond, who was not so much reading as glaring at the latest Catholic Worker, which he held open at arm’s length as if the paper might be toxic. There was an article of Merton’s in it, an; essays about the urgency of taking steps to prevent nuclear war. Father Raymond looked up, saw us coming his way, balled the paper up in his fist, hurled it into the garbage container, and strode away without a word, leaving a trail of smoke. One evening a day or two after our arrival later when Merton knocked on my door. He was on his way to Vespers and already had on the heavy white woolen choir robe the monks wore during winter months while in church. It was an impressive garment. I reached out to feel it thickness and density. In a flash Merton slid out of it and placed it over my head. I was astonished at how heavy it was! Once again, Merton laughed. The robe met a practical need, he explained, as it was hardly warmer in the church than it was outside. Without it, the monks would freeze to death. I had no idea, no more than he, but I got a glimpse of an answer before my stay was over. A friend at the Catholic Worker had sent a letter to Merton in my care. He urged Merton to leave the monastery and do something “more relevant,” such as join a Catholic Worker community. (Over the years Merton received quite a few letters telling him that he was in the wrong place.) I was a little embarrassed to be delivering such a message. What is most memorable to me about this particular letter was the experience of watching Merton the writer at work. He had a small office just outside the classroom where he taught the novices. On his desk was a large gray typewriter. He inserted a piece of monastery stationery and wrote a reply that seemed to issue from the typewriter at the speed of light. I had never seen anyone write so quickly. You will often see a stenographer type at such speed when copying a text, but even in a city news room one rarely sees anyone writing at a similar pace. I wish I had made a copy of his response. I recall Merton admitted that there was much to reform in monasteries and that monastic life was not a vocation to which God called many people, yet he gave an explanation of why he thought the monastic life was nonetheless an authentic Christian vocation and how crucial it was for him to remain faithful to what God had called him to. It was a very solid, carefully reasoned letter, filling one side of a sheet of paper, and was written in just a few minutes. When I first met Merton, more than two years had passed since the Vatican’s denial of his request to move to another monastery where he might live in greater solitude. By the time of my visit, he was able to spend part of his time in a newly built cinderblock building that stood on the edge of the woods about a mile north of the monastery. It had initially been intended as a conference center where Merton could meet with non-Catholic visitors, but he saw it primarily as his hermitage. Merton had lit the first fire in the fireplace just two months before. There was a small bedroom behind the main room. Merton occasionally had permission to stay overnight, but it would not be until the summer of 1965 that he became a fulltime hermit.